Hola Amigas! I can't believe its Friday. Where did the week go? Have you been enjoying this beautiful weather? Solimar, Joaquin and I have! Well this week we have a GREAT color challenge brought to us by Mitzi. I hope you will play along with the Stamp A Holics. Looking forward to seeing your artwork. Have a GREAT Weekend! That is such a nice stamp set! 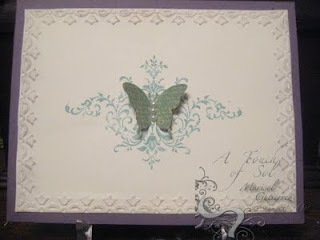 Love the way you used the colors and the embossing - elegant! Thanks for being a great part of the Stampaholics Marisol. We appreciate you!